A new build (open in July 2016) with a conference centre attached, the Radisson is an impressive and colourful piece of architecture with stripes of colour wrapped vertically around the outside of the building, a reference to the traditional African basket weaving of Rwanda. 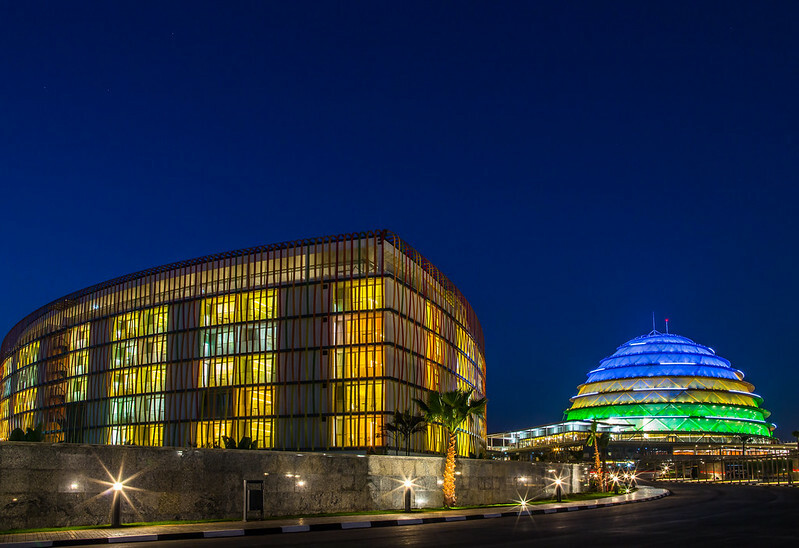 In addition, the arresting dome of the next door conference centre is like the former tribal President’s palace – and lights up in various shades of the Rwandan flag at night. There is a strict airport-style security check at the gate of the hotel and then you drive (or walk, if returning from the nearby shops) up the drive to the main entrance of the hotel (on the left) or the conference centre (on the right). The reception is an atrium rising the full height of the hotel (five floors). Check-in was a little slow, but friendly. There are lots of beige leather seats in curves with a echo in the lighting overhead, and a giant TV screen showing Rwandan success stories. The hotel is bright with a lot of glass – taking advantage of the security at the perimeter there is a sense of light throughout the hotel and you feel as though you are on a business park – on top of a hill – rather than in a hotel relatively close to the airport. Corridors are in a distinctive colour depending on the floor you are on – my floor was deep, almost blood red orange. Staff were good at a friendly smile as you passed, and language skills were good. About a ten-minute drive to the airport. It is connected to the new Kigali Convention Centre and just opposite the high-end shopping mall of Kigali Heights. The 292 rooms are in two wings looking across to the conference centre, over the pool or out towards the city. All have balconies with screens to keep out insects, effective air conditioning, mini bar, tea and coffee making, good showers and free wifi. The showers have a full-length glass frosted window in front of them, no one can see through, and there is a blind you can lower over it, but I found in the morning a lot of light came in through this and then through the glass door of the bathroom. Security is good – you need a key card to access the room floors by elevator, but the design of the hotel means you could get up there using the stairs, but then in addition the room corridors require key card access, and then finally, of course, the room. The hotel is connected on the first and second floor across to the conference centre, and over there is the Business Class Lounge on the second floor accessible by a covered bridge from the hotel. There are 209 Standard Rooms (36sqm), four Accessible Rooms, 68 Business Rooms (38sqm) which have the addition of bathrobes and a Nespresso machine, five Junior Suites (70sqm), five Presidential Suites and one Diplomatic Suite. There are two restaurants. The Larder is the all-day dining, serving continental and Rwandan food as well as a very good buffet breakfast. The Larder has an outdoor area next to the pool. Filini is an Italian restaurant on the conference centre side. In addition, the Lounge bar overlooks the pool and has outdoor seating, while La Piazza bar is on the conference centre side two floors up and has an outdoor terrace. All of these are in the conference centre. It has a net floor area of 32,200sqm and as well as a giant ballroom with space for a banquet for 1200 there is an auditorium which can take 3,000 people. In total there are 18 meeting rooms of all sizes, break out areas, outdoor areas and parking for 650 cars. The hotel has a good-sized gym with Technogym equipment and also a spa by Amani with seven treatment rooms, and male and female steam and sauna areas. There are also running routes around the grounds and the vicinity and a floor lit tennis court I wish I’d had time to use. This is a lovely hotel: bright, spacious, with a good position equidistant between the airport and Kigali city centre, and even has high end shopping a short walk away.